Heart Teacher, Daughter of the King, Musician, Teammate, Mommy, Crafter, Adventurer, Kingdom Persuer, Healthy Eater, Gift Giver and Work-in-Progress. Every spring and fall my husband teaches Outdoor Education to local 5th and 6th graders. A part of the educational process includes teaching about food waste and composting. On an average day 100 students fill about 1 trash drum full of food waste. During the week of the food waste challenge,they end up with 20lbs for the entire week of food (including breakfast, lunch and dinner), and then it gets composted and used in the garden. Happy Dance! We begin the food waste challenge by talking to the students about what happens when you waste food. When you waste, it goes into landfills. In the landfill it gets closed into a plastic bag and produces methane gas. Methane gas when released absorbs the suns heat, warming the atmosphere. We also share about stewardship and the resources God has given us. Our hope is to increase their awareness of the people around them, noticing that when we consider our waste we may have more to share with others in need. Kids can learn to be less wasteful and better stewards of the land. 1. Appeal to the “why” of less food waste. Brief your students in the environmental impact of wasting food. Be sure to include the importance of not using more than we need. Place pictures of children in poverty areas in your food waste station and talk about what you can do to help. Think about making a donation based on how much your class can conserve. Talk about the importance of caring for others as we care for the land. 2. Set up a “food waste challenge” station. This can be set up in your classroom or cafeteria. Chart how much was wasted at lunch time before the challenge started. Challenge students to only take what they will eat. Students will weigh in their food scraps and tally up the ounces every day for a week. Think about making a goal chart and having rewards for each goal point that relate to helping others who may have less. 3. Place scraps in a bucket with a lid every day (may need to store outside of classroom door). If possible add these scraps to a composting station on campus. If that’s not possible, ask around for a local gardener or community garden that could use the scraps in their compost. 4. Build a simple compost bin like these! Involve your students in the daily composting routine. Start with a pile of carbon materials (anything brown 🙂 paper, cardboard, leaves, grass etc), then add your food scraps daily and cover with more carbon materials. For more in depth composting check out this Composting 101 article. An important part of caring for our earth includes decreasing food waste. Helping young people see the importance of resourcefulness with food can be easy and fun. An added bonus is the joy of sharing our resources when we only use what we need. Are you wanting to help the children in your life engage in nature, but it seems too complicated or time consuming? Plant Something. Plant a few small seeds in a garden pod or small cup. Put it by a window to water and watch. You could even plant a tree together, in your yard or school grounds. Easy accountability. Have a simple plant journal where kids record their daily plant growth (Here’s a Free Simple Plant Journal you could use!) You could even do an easy nature scavenger hunt to increase awareness. Get outside everyday. Consistency in the out-of-doors overtime really creates awareness and momentum to engage in future nature encounters. A simple walk on a wooded trail, while asking questions about the area, is a great place to start. Take time to observe. During your daily outside time, set aside a place or time to just watch nature quietly. This skill will probably take some time to develop, but make it fun by sharing with each other your observations (including sounds of birds etc). Create a space that is their own. If you have a garden space at home or school (community gardens are a great option as well), think about creating a special section that children can take ownership of. Children love to engage in planting, watering and harvesting. Consider planting some of each child’s favorite foods that they could pick and eat right out of the garden. Keep it simple. Whatever you decide to do, remember to keep it simple. Try not to over think, over prep, or expect too much (aka too many materials, hike 16 miles our first day, etc). The important thing is to simply expose kids to nature and have it be a positive experience. Our first goal is to awaken their curiosity to the natural world. Engaging kids in nature is so important, but it doesn’t have to be complicated. What are some of your favorite ideas to get kids connected with nature? With Valentine’s Day just around the corner, I thought it would be a perfect time to focus on LOVE (I want you all to know that I’m writing this article just as much for myself as for you). Genuine, caring, heart-felt love for our students can be a game-changer in their lives..and in ours as well. We all know the education system from our childhood isn’t near the same as the one today. Gone are the days of big teacher hugs, pats on the back, and most physical displays of affection in a lot of our school settings. Most educators I know are passionate about teaching and deeply care about their students and their well-being. It’s one of the main reasons they teach, to make a difference in the life of a child. But how do you show your students that you care about them, when you can’t even give them a hug when they’re feeling down?? 1. Give eye contact with a smile. Connections most definitely come through eye contact and what follows. It sends the message of acceptance and love, or disapproval and rejection. Think about the random smiles you receive from those you love. They definitely create that warm and safe feeling inside. The same will happen for your students. Make a point to look your student’s in the eyes and smile. 2. Speak kind words. As educators you most definitely know the difference between your students saying “Yes, Teacher” with a loving tone, or “Yes, Teacher” with a grunt and eye roll. Speak love into your students lives. Be mindful of the way you speak your words and the tone you choose to use. Even a simple “Good Morning Lexi, How was your evening?” in the right tone can create the atmosphere of kindness and love you are looking for in your classroom. 3. Be interested and ask questions. Think about a time when someone has met you several times, yet the questions they ask certainly confirm “You don’t know me”. Get to know your students. Ask them questions about their hobbies, favorite foods, books, sisters, brothers…them! If you need to, keep a journal with answers they have given you so you can reflect on them later. Throughout the year, ask them questions about the topics earlier discussed (How is your dog’s foot after he stepped on that spur? Did your brother throw his broccoli on the ground during dinner AGAIN last night?) Showing a genuine interest in their lives will go extremely far in showing that you truly care. 4. Be present. I feel that as educators it can be one of the most difficult challenges to be present with each child. We are amazing multi-taskers and are usually thinking of 100 other things while we are teaching each class and each student (Uh oh, Johnny’s out of his seat again…Did I pass out the correct worksheet?… Who’s on after school duty?…Did I start the crockpot before I left this morning?) It is so important that our students see and know we are present with them. This means focusing in on staying in the moment when possible. Everyone knows what it is like to be with someone that seems to want to be somewhere else. Give your students the gift of being in the moment. Be Present. 5. Have a special routine. Connections are really amplified through three main areas: eye contact, physical touch and fun. Since most of us can’t go mauling our students every morning with a huge hug and thousands of kisses… we need other appropriate ways to connect through physical touch. There’s nothing like a good ole high-five or the sweet old-fashioned “secret handshakes” of our childhood (we seriously rocked the “Say Say My Playmate” chant in 3rd Grade). Why not come up with a fun “Good Morning Handshake” when your students come in the door or right before you leave. You could really jazz this up with serious knee clapping, finger snapping, spinning around and the whole shebang. Even older students would love to participate in coming up with their own celebration “handshake”. Check out “I Love You Rituals” by Becky Bailey for more great connection ideas. 6. Find out your student’s “Love Language”. The five love languages of children are: Physical Touch, Words of Affirmation, Quality Time, Gifts and Acts of Service; as laid out in Gary Chapman’s book The 5 Love Languages of Children. Check out the book “The Five Love Languages of Kids” by Gary Chapman for an in-depth look at each love language. You can even group your students into each category for a quick and easy love check list. Once you have a list you can check it daily. Then go through your list and speak words of affirmation to those that need it, spend one-on-one extra time etc. with each student according to their specific need. Intentionality doesn’t equal fake, it means that you are wanting to meet those needs and show love to your students. 7. Love them. Ha! This one is a little bit of a tricky play on words. On a serious note though, sometimes it’s hard to love and care about some students that are…well…a little difficult to love and care about. Can you find one thing today that you like or appreciate about each student? I would suggest making a list to help bring some of those positive things to the front of your mind. Even if you are struggling with what to write for a particular student, keep in mind that in reality you don’t need a reason. Each child deserves to be loved, regardless of whether they act like it or not. Looking back I can distinctly remember my teachers that were kind and showed me genuine love. That love and kindness made more of an impact on me then all of the Math, Language, Science etc. ever could. P.S. Don’t be surprised if your students start doing some of these same things with each other. When a culture of love and acceptance in cultivated, there’s no telling where it’s impact will end. If you’re looking for a craftivity to use around Valentine’s Day to connect with your student’s hearts and to teach them how to be more loving to others, check out my THANKFUL HEART CRAFTIVITY. It’s all about heart-felt gratitude and helping your students learn to show appreciation to others. Click on the picture for this FREE Bible verse printable. I don’t know about you, but this can feel overwhelming and completely paralyzing for me… after all, I realize that I can’t possibly help every person poorly clothed or lacking in daily food. I do know one place to start though, and that is ME and my heart. I can start by recognizing the blessings in my own life and being thankful for them. I recognize that what I am focused on can be in turn what my children end up focusing on. It has been on my heart lately more than ever to help my daughter focus on kindness and thankfulness. We’ve started writing down what we are thankful for every day and putting it where we can see it. I created this family blessings printable that you can use for your family or in your classroom (There’s a printable that just says “Give Thanks”). You can write each person’s name at the top and then every day write something new (The easiest way to do this would be to laminate it, stick it in a page protector sheet or in a picture frame with glass over it. Then use a dry-erase marker or visa-versa and reuse it daily. Click on the above picture for the FREE Family Blessings Download. Click on the picture to head to the craftivity. I also created this hands-on craftivity that helps children focus on thankfulness. I also want my kids and I to focus on others and their needs. No matter how big the need is we can all do something. 🙂 This year we focused on filling a bag for a family in need for Thanksgiving. 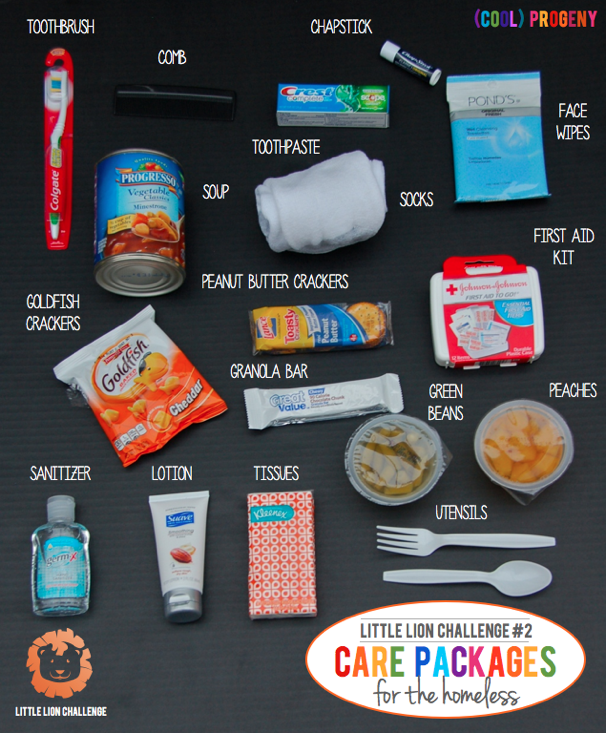 Click on the above picture to head to “CoolProgeny” for this homeless care package idea. My hope is that we can instill thankfulness and a giving heart in this generation of young people. I know that it needs to start somewhere, it needs to start with Me. Do you have any thankfulness ideas to share? I would love to hear them in the comments below. 2. Balance feels best. Doing things we enjoy outside of our career makes us happier, well-rounded individuals. If you value family, incorporate more family time…you love sailing?? Be sure to get out and do that. All work and no play is not good for anyone. 3. Work Smarter not Harder – Don’t try to reinvent the wheel (at least not the whole wheel 😉 ) These days with Pinterest and TpT etc there’s almost an overwhelming amount of resources on any given topic. These resources are there to make our lives a little easier…don’t feel like you always have to be coming up with something new to be a good teacher. Focus your energy on interactions with the kids or another area that you feel will make a lasting difference. Find your “most important thing” and do it. 4. Find your purpose/passion and use it as fuel. Sometimes it’s easy to lose focus on your “why” when you’re neck deep in paper work, staff meetings, professional development, disgruntled parents or kids etc… Think back to your motivation when you became and teacher. Was it to invest in leaders for tomorrow? Was it to help poor and impoverished children have a chance to make sometime of themselves? Was it simply to pour love into the life of a child? To give an excellent year of education to students at your school? Whatever it was, bring it back to the surface. Post it where you can see it every day and use it on the days you are feeling down and out. 5. Get Organized at the beginning (a Sunday well spent brings a week of content). The more time I spend at the beginning of the year organizing my yearly plans, goals, classroom set-up, management systems etc. undoubtedly pays dividends during the year. The same is true for planning time spent for the next week. I looooooovveeee to get to the “fun” part of projects, the crafty part or action of setting up the room. When I dive in without a plan I usually end-up with a headache and more work for myself. Put the time in at the beginning of the year and week to plan and you won’t regret it. 6. Surround yourself with positive uplifting people. This post is about keeping your sanity in your work. I feel like negativity and insanity are words that could almost be used interchangeably on some levels. Find those people in your life that lift you up and spend the majority of your time with them. By the way, you become who you hang out with, so make sure you’re someone that’s lifting up others too. 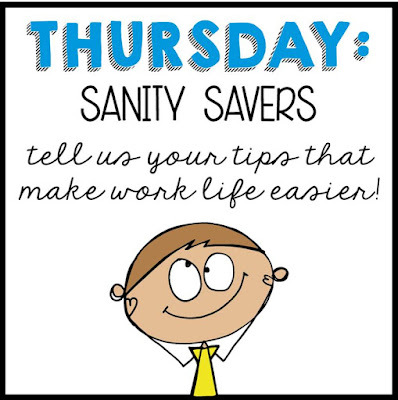 What are some ways you make work life easier? Today I’m linking up with Blog Hoppin’ to share some quick and easy make ahead meal ideas. For me I know that when I’m hungry I need to eat…and I mean RIGHT AWAY! So I can’t mess around with a lot of prep at meal time. I would rather put the time in on a different day, when I’m not so hungry, and basically have a grab-and-go type meal during meal times. I love quick, easy, healthy meals like this quinoa spread. Here’s the recipe! Quick and easy food doesn’t have to compromise delicious flavor and nutrition (unless we’re talking fast food and then..well all bets are off). One of our favorite quick weekly lunch ideas is salad jars. I love that you can make them any type of salad you want and then store them in the fridge and grab out during the week when you’re ready to eat. Good-To-Go! My favorite salad to make is taco salad. I put all of the wet ingredients at the bottom of the jar (beans, tomatoes, etc) and then put the lettuce at the top so it doesn’t get too soggy. Then I grab a baggy of chips to bring along and during lunchtime just mix them all together on a plate and VIOLA insta-delicious and nutritious lunch. Our salad jars usually keep in the refrigerator about 4 or 5 days. 2. Layer in your heartier veggies or toppings next; beans, cucumbers, carrots etc. 3. Then, place your lighter ingredients like quinoa, tomatoes, strawberries, mandarin oranges, onions etc. 4. On the very top stack your favorite greens. My personal favorite is a mixed salad greens that includes spinach. Yum-O-Me! 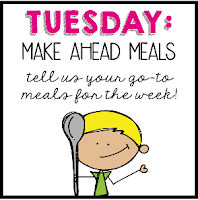 We also love and use Plan-to-Eat weekly to make our menu. It automatically generates your shopping list for you and you can store your recipes on the site too. I love that I can set it up to cook and meal prep right from my iPad or phone. If you become friends with us on the site you can see all of our recipes and menus too. It’s pretty cool! If you want a free trial check it out HERE. I would love to hear what you do for easy meal prepping during the week. Comment below with your favorite quick and healthy meal idea. 5 (or 6) Fun Facts About Me! 1. I taught 1st & 2nd grade for 7 years and am now a WAHM full-time :). After our first child was born, I taught for one more year in the classroom. We now have two little ones and I’m teaching them full-time 😉 and creating fun products for teachers all over the world through TpT. I LOOOVE knowing that I’m still impacting children and classrooms AND that I’m able to be with my kids, while they’re young especially (my dream!). So blessed! 2. My husband and I met on our college Acro-Gymnastics Team. We actually started dating after a big gymnastics trip we went on (it wasn’t bad that the trip happened to be to the Bahamas). We recently went back to our alma mater for a huge gymnastics team reunion and we were able to participate in their gymnastics Home Show. It was such a blast to be able to be back on the mats again…AND it certainly reminded us of our age (we were SO sore the next day) and how we can’t flip around like we did when we were 20. We loved it anyway! 5. I love to travel, especially traveling with a purpose. In college I took a year off to teach Kindergarten on the island of Palau in the Pacific Ocean. It was one of the hardest years of probably the most growth in my life. I learned so much about myself and really grew up, while experiencing some of the world’s best scuba diving, traveling to China and the Great Wall, and having 15 little people walking around with a piece of my heart for the first time (but certainly not the last). I would love to know more about you! Leave a comment below telling me some fun facts about yourself OR let me know if you linked up too, so I can head on over to your blog to read all about you! This week I’m joining in The Creative Classroom‘s GRAND celebration! She has reached 1,000 followers (A GRAND 😉 ) on TpT and to celebrate we’re all joining in to give away $100 to TpT! WAHOO!!! This GRAND giveaway begins Today and runs till midnight Saturday. Winner will be announced Sunday! Use the Rafflecopter below to enter. If you get a chance head on over to The Creative Classroom’s blog and give her a huge congratulations on her amazing (and GRAND 😉 ) milestone. This post was originally a guest post I did for Trina @ beginnerbeans.com. I thought it would be helpful here for those of you heading back-to-school with your own kiddos or for teachers to share with parents who may want some extra tips in easing into the new school year. 1 | Set a routine. Night-time (getting to bed at a decent time is so important), clothes laid out, baths, breakfast, out the door time, etc. I love the visual schedules for kids that have pictures of what they need to do to get ready in the morning. 2 | Make time for a quality breakfast. Breakfast is the most important meal of the day. Try to make it a priority to give your child a nutritious and ﬁlling breakfast. It’s a long time before lunch and a grumbling stomach makes it very difﬁcult to concentrate in the classroom. 3 | Create a quiet space with adequate supplies for “homework”. Continue to be involved in their learning by reading with them, asking what they learned in school that day, and communicating with their teacher. A parent is a child’s ﬁrst teacher after all! 4 | Stick to the list. 5 | Allow your child the freedom to have school be their space. Wait for them to invite you into their world. This may include letting them say good-bye to you at the door, allowing them to carry their own backpack and supplies, and respecting their newfound independence. They still love you and want you to be proud of them! 6 | Give your child (and yourself) some grace! 7 | Speaking of grace…your child’s teacher could use some too! Remember that we’re all human and make mistakes; your child’s teacher is no different. At the same time, they’ve committed their life to pouring themselves into children and specifically into your child, so give them grace and thank them when you can. Don’t forget you’re both on the same team for your child! 8 | Make it special. Think of a special way to let your child know you love and support them this year. It can be committing to place notes in their snack or lunch boxes every day, setting aside special time when they get home to have time to talk about their day, or a special handshake or signal when you drop them off that is just for them. It doesn’t have to be much, but knowing that mom or dad is rooting for them during the day can give them the conﬁdence they need to tackle those difﬁcult tasks at school. Back to school time can be a tough transition time for everyone involved, but being positive and having an open mind with your child and school can make all the difference. This year will be what you make it. If you think this will be the best year yet (or the worst ever)… you’re right. Make it a good one! I have to be honest, I’m really hoping that Punxsutawney Phil does not see his shadow this year! I love warm weather and I’m already ready for some sunny days and gardening. I created this Groundhog Day Unit as a fun way for students to learn some facts about groundhogs and make an enjoyable craft at the same time. I almost squealed with delight the first time I had the groundhog pop in and back out of his burrow with the craft stick.